I hope you are all doing well on this sunny day – well at least it is sunny here in the UK. And of course sunny means flowers! I have a floral birthday card for you today, using a set I bought recently from Simon Says Stamp – it’s called Even More Spring Flowers. SSS have a number of these stamp sets now which feature the stitched line detail, and I always love the contemporary look of them. I have a Christmas set, but you know, I would like one for every season if I could! So, today I am playing along in the Simon Says Stamp Flickr Challenge which is all about stencils. I started off by applying Black Soot Distress Ink through my stencil onto some dark grey cardstock and then I trimmed the panel down a little bit, so that it would leave a little white border from the base card showing around the edge. 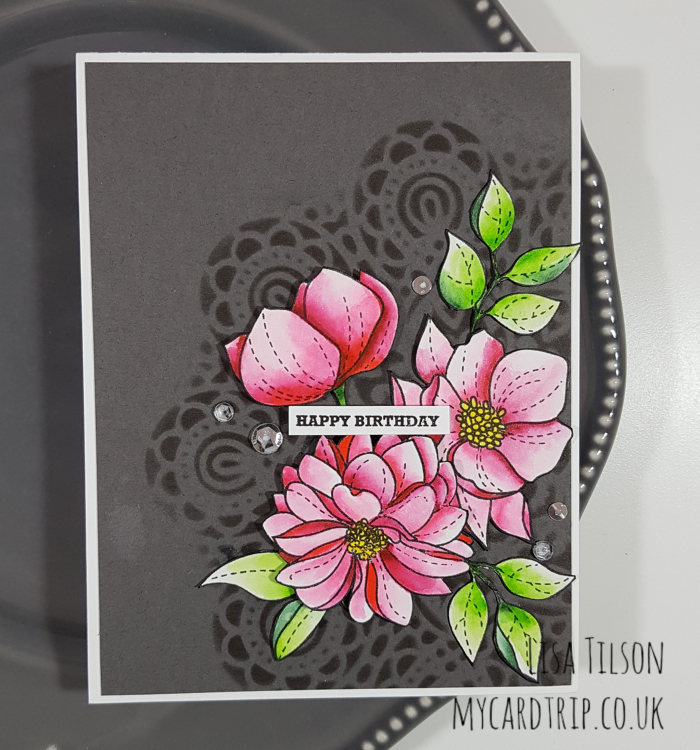 Next I stamped a whole load of florals onto some Strathmore Bristol Smooth cardstock using Versafine Onyx Black Ink and coloured them with my Zigs. As I don’t usually buy the dies, I then had to fussy but them out. All I can say is that it is a good job those leaves get tucked behind the flowers as it wasn’t possible to fussy cut them without cutting them apart! I played around with the arrangement and when I was happy with it, I took a photo so that I could replicate it. The leaves were all adhered with wet adhesive and the florals were either adhered with wet glue or foam tape – so there is some dimension to the card. 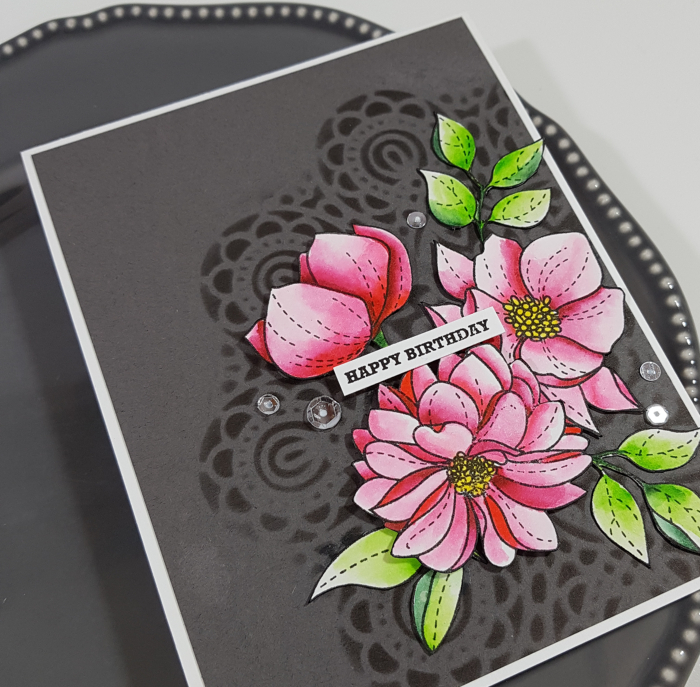 I really love the added detail of the stencil behind the flowers – it gives the card so much more interest. Lastly, I stamped the greeting onto Neenah Solar White cardstock with Versafine Onyx Black Ink and mounted it with a double layer of foam tape onto the top of the flowers. I added a spattering of sequins for bling, as usual! That finishes my card for today. It will be entered into the current Simon Says Stamp Flickr Challenge and the Simon Says Stamp Monday Challenge. Thank you as always for stopping by, I will be back tomorrow with a card and video for you featuring one of the products from the new Simon Says Stamp Release.